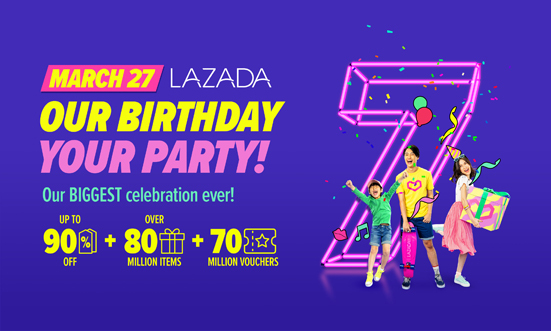 Online shopping platform Lazada celebrates its 7th birthday tomorrow with discounts up to 90 percent on various brands and a star-studded online party. The in-app livestream Super Party held on March 26 featured Grammy and Brit Awards winner and British pop star Dua Lipa together with Nadine Lustre, Sam Concepcion, and Miss Universe 2015 Pia Wurtzbach. L’Oréal Paris, Maybelline New York, and Garnier are joining the birthday bash with up to 50 percent discount on their bestselling makeup, skin care, and hair care products. During its flash sale (12:00 a.m. to 2:00 a.m. and 12:00 p.m. to 2:00 p.m.), Maybelline New York offers 50 percent off on Superstay Liquid Foundation, and Powder Matte and Creamy Matte lipsticks. It also offers P100 off all 34 shades of Superstay Matte Ink. L’Oreal Paris, meanwhile, is giving a free Color Riche Lipstick for every purchase of Rouge Signature Lipstick, and a free Magic Retouch Gray Root Concealer Spray for every purchase of Excellence Hair Color. 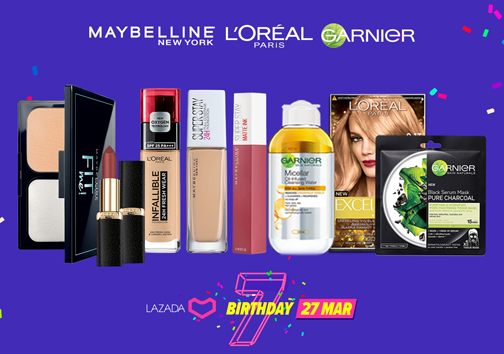 L’Oreal Paris, Maybelline New York, and Garnier offer discounts and freebies during the Lazada anniversary sale. Garnier offers 22 percent off storewide. Customers also get a free mask head band for every purchase of Garnier Serum Mask Trial Pack.